Heather and Dave have found the perfect place to raise their first child. The house has character, but it’s the garden that really makes it: red-faced impatiens, pockmarked gums, six upright pittosporums to keep the neighbours out. It’s a jungle. A hiding place. A refuge. And then, without warning, that life is over. 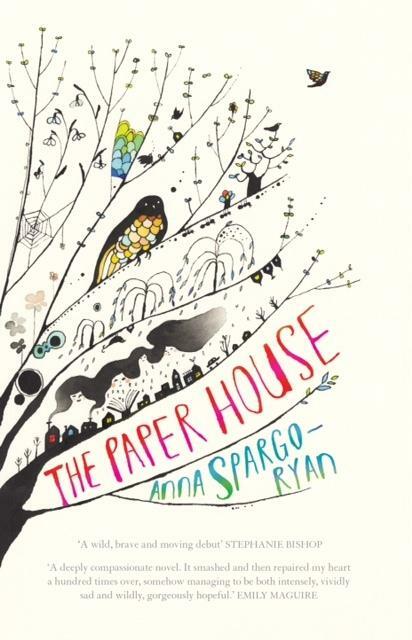 Anna Spargo-Ryan’s debut novel, The Paper House, is a tender evocation of a marriage, an imperfect family and a community. Spargo-Ryan’s ability to create characters for whom the reader is wholeheartedly barracking provides much of this novel’s charm. Heather and Dave are expecting their first child. Their city flat is not where they want to raise a child, so they scour the city and beyond for a house. They fall in love with a home on the Mornington Peninsula – it has a porch, and a wonderful, expansive garden. But when tragedy occurs, Heather returns to the house with dreams shattered. She seeks solace in drawing, and in exploring the garden during sleepless nights. Spargo-Ryan empathically weaves the narrative of Heather’s descent into mental illness, with the story of Heather’s own mother’s struggle. Not only is mental illness portrayed convincingly, but so too the best efforts, helplessness and frustration of those trying to support Heather. While Dave is dealing with his own grief he must work as a teacher, so he invites Heather’s sister Fleur, a tough no-nonsense vet who has been working on a sheep station, to stay with them. Then Heather and Fleur’s father, whom they haven’t seen for a long period, arrives as back-up. Spargo-Ryan is a young writer to watch – she blogs, tweets and publishes stories and articles. She is not afraid to delve into difficult areas and is open about her own experience of mental illness. Her writing in this novel really sings – the descriptions are beautiful, quirky and wholly original. Despite the seriousness of its content, the novel has light touches too – Heather, Dave and Fleur’s relationship with their neighbours has comedic moments. Highly recommended for book groups, admirers of Australian author Inga Simpson’s novels, and anyone who enjoyed the pathos and warmth of Josh Thomas’s Please Like Me series on ABC TV.